Bedale station is located on the Wensleydale Railway line which runs from Northallerton and terminates at Redmire in the heart of Wensleydale. 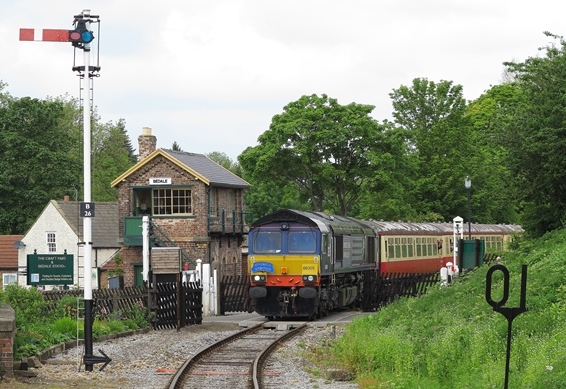 The line is operated by the Wensleydale Railway Company who run diesel and steam hauled services and special trains for most months of the year. For the timetable, fares and further information visit the Wensleydale Railway website. Commencing in 1847 the line was built in stages and at its height ran from Northallerton, in the east, to Garsdale, on the Settle to Carlisle line, in the West. With the increase in road travel regular passenger services ended in 1954, however Bedale and Leyburn stations remained open for freight traffic. By the late 1980’s only the limestone trains running from the Redmire quarrys to the steelworks at Redcar remained. In 1992 the limestone trains ceased and the line was scheduled for closure. It was saved by The Ministry of Defence who decided to use the branch for the occasional transport of military vehicles. The line is now operated by The Wensleydale Railway plc who began running passenger services in 2003. Bedale Station was opened in 1855. Bedale signal box was constructed to supervise the crossing and the adjacent passing loop.